A synthetic cannabis-like drug in a pill was safe and effective in treating obstructive sleep apnea in the first large multi-site study of a drug for apnea funded by the National Institutes of Health. The study was conducted at Northwestern Medicine and the University of Illinois at Chicago (UIC). There is currently no drug treatment for sleep apnea, a sleep breathing disorder affecting about 30 million individuals in the United States. In sleep apnea, breathing is interrupted, and these pauses can last from a few seconds to minutes and may occur 30 times or more an hour. Untreated apnea raises the risk of heart disease, diabetes, sleepiness, cognitive impairment and a motor vehicle accident. Participants in the trial had reduced apnea and decreased subjective sleepiness. The common treatment for sleep apnea is a CPAP (Continuous Positive Airway Pressure) device that delivers air (acting like an air splint) to prevent the collapse of the airway and breathing pauses. But adherence to the device can be challenging for many patients, some who simply stop using it. “There is a tremendous need for effective, new treatments in obstructive sleep apnea,” said co-lead study author David W. Carley, the Katherine M. Minnich Endowed Professor Emeritus of Biobehavioral Health Sciences, Medicine and Bioengineering at UIC. Researchers investigated the effect of dronabinol, a synthetic version of the molecule Delta-9 THC (tetrahydrocannabinol), which is in cannabis, on sleep apnea in a Phase 2 trial. The trial was the largest and longest randomized, controlled trial to test a drug treatment for sleep apnea. Dronabinol was approved by the Food and Drug Administration more than 25 years ago to treat nausea and vomiting in chemotherapy patients. The drug treatment was a new approach in that it targeted the brain rather than the physical problem of collapsing airways. This reflects the new belief that sleep apnea is not just a physical problem but may be caused by multiple factors. One of those is poor regulation of the upper airway muscles by the brain, said co-lead author Dr. Phyllis Zee. Zee is the Benjamin and Virginia T. Boshes Professor of Neurology at Northwestern University Feinberg School of Medicine and director of the Northwestern Medicine Sleep Disorders Center. While CPAP is highly effective, some patients simply refuse to use the machine. Even people who want to use it often only stick with it for about four hours a night, on average, Carley said. The final version of the paper will be published Dec. 5 in the journal SLEEP. In the study, 73 adult patients with moderate or severe sleep apnea were divided into three groups. One group was given a low dose of the drug, a second group received a higher dose and the third, a placebo. Participants took the drug once daily before bed for six weeks. Six weeks of treatment by the highest dose of dronabinol (10 milligrams) was associated with a lower frequency of apneas or hypopneas (overly shallow breathing) during sleep, decreased subjective sleepiness and greater overall treatment satisfaction compared to the placebo group. The severity of their disorder was reduced by 33 percent compared to complete compliance with the mechanical treatment, although complete compliance for the night is rare. 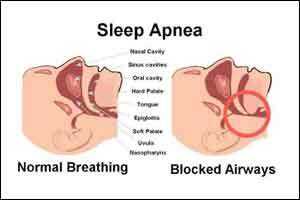 Can a person simply ingest or smoke marijuana and get the same benefits for sleep apnea? “Cannabis contains dozens of active ingredients, but we tested just purified delta-9 THC,” added Carley. Larger scale clinical trials are needed to clarify the best approach to cannabinoid therapy in obstructive sleep apnea, the authors said. UIC has licensed intellectual property related to the experimental drug treatment used in the study to the pharmaceutical company RespireRx. Researchers have attempted to identify drugs to treat sleep apnea for nearly 35 years, but to no avail, Carley said. Carley developed the idea that dronabinol might be useful in treating sleep apnea more than 15 years ago. He and colleagues tested the concept in an animal model of apnea, publishing their findings in the journal SLEEP in 2002 and launched a subsequent pilot study in humans in 2007. Those encouraging findings from the small-scale pilot study formed the basis for this multi-center clinical trial led by Carley and Zee. “By providing a path toward the first viable obstructive sleep apnea drug, our studies could have a major impact on clinical practice,” he said. Coauthors on the study include Bharati Prasad, Boris Vern, Hui Xie, and Chengbo Yuan, all of UIC; and Kathryn Jean Reid, Dr. Roneil Malkani, Dr. Hrayr Attarian and Dr. Sabra Abbott, all of Northwestern. The research was supported by grant from the UM1-HL112856 of the National Institutes of Health.